For ten years I’ve called Evelynn a friend. After yesterday, and what she and her family did for Liam, I feel like I should call her family, and I don’t know if I’ll ever be able to thank her enough. “Hey Eric, have you taken Liam to get his picture taken with Santa yet this year ?” She asked, the beginning of last week, as I made my way into the office. “Hmmm, No. Actually Liam hasn’t ever met Santa Claus yet, we just can’t wait in a germy line of kids at the mall or anything. Someday though, and he’s almost 6 years old now so soon I hope.” I explained, but Evelynn asks about Liam every day. She knows the deal. “PERFECT! !” She shouted ” what are you doing next Saturday? You have to come to my sister’s house.” She picked up the phone in front of her and held a finger up to make sure I didn’t walk away. “Yeah, it’s me, what time on Saturday? Liam is going to come….. Liam!, that kid I was telling you about. His family is going to come on Saturday. Ok. I’ll let him know.” She hung up the phone and that was that. On my way into work on a monday morning I somehow had made plans to go to someone from work’s sister’s house for dinner on Saturday night. And I still wasn’t exactly sure why. If we came to her sister’s house on Saturday night, Liam would finally get to meet Santa. Evelynn’s sister’s family had had her own children’s pictures taken with Santa and Mrs. Claus at a local restaurant from when they were infants until they were in college. With all the kids home for the holiday this year they had hoped to continue the tradition with a picture of their nearly adult children but the restaurant now closed leaving them without a place for Santa to see them this year. Until Evelynn’s sister had run into Mrs. Claus somewhere shopping. Mrs. Claus explained that Santa would be happy to stop by her house to take the picture, and a date was set. Plans were made. Santa was coming, and by Evelynn’s thoughtfulness, and her entire family’s boundless generosity, it turned into one of the most magical evenings of my life. We arrived a little early, and after getting Liam’s chair up the portable ramp we travel with, introductions were made. Introductions made so warm and comfortable that we were instantly set at an ease of familiarity among a group of strangers and one acquaintance. No one asked about Liam’s chair, or his syndrome, or his wheelchair, but each and every one of them pinched his cheeks, and said hello, and told him how handsome he was. A house filled with relatives and lifelong friends who instantly treated us as one of their own. And when they all heard that Liam had never before met Santa Claus, the entire party seemed to change from a oppurtunity for them to relive old family traditions to a celebration of their part in starting a new one for us. And then Santa arrived and met Liam. Along with Mrs. Claus and their elf helper Tiny, Santa was able to stay for about 45 minutes. He sat, holding Liam’s hand and whispering in his ear for easily 35 of them. Concerned that we were monopolizing Santa’s time too much, many in the room with their own camera’s firing away and with joyful happy tears in their eyes waved away my concern telling us and Liam to take as much time as we wanted. They would ultimately get their own pictures taken but their patience and interest in being a part of Liam’s first exposure to Santa was truly a testament to the power of the Christmas Spirit as hokey and Charlie Brown Christmas as that may sound. Liam had slept for almost 22 hours that day. A rough end to the week with seizures induced a medicine change on friday night which wiped him right out for most of Saturday. Most but not all, for when St. Nick was whispering in his ear and holding his hand, Liam was wide-eyed and alert, engaged in communication and tugging for dear life on Santa’s beard with his free hand. Liam won’t tell me what they talked about. He won’t even tell me if Santa told him if he’s on the nice list or not. Whatever Santa had to say to Liam will always stay between them. I like that. After Santa had to leave and get back to his busy week-before-Christmas schedule, we stayed and we ate dinner and we got to know everyone a little better. When they found out that Liam’s birthday is the day after Christmas the whole group of our new friends sang Happy Birthday to him. We left happy and to invitations for future plans including a repeat holiday visit next year if possible, and as we made our way out the front door and down the ramp the first snow of the season here started sticking to the ground. The magic of friendship, the magic of a kind and open-hearted family, and the magic of Liam’s positivity and love. But, I think most of all, it was the magic of Santa. ← Storify of a Surgery. Oh, wonderful That IS utterly magical. I’m so happy for ya’ll and thrilled that Liam had that time alone with Santa. What a dear man. What a great experience…thank you for sharing! Heartwarming. This is what Christmas is all about! God bless you all. So lovely! Have a great Christmas, and birthday too! Speaking on behalf of all my family members it is was pleasure and honor to be part of Liam’s first visit with Santa.. In this season of hustle and bustle and signs of hatred throughout the world, it warmed our hearts and gave us the opportunity to experience that REAL Christmas Magic that we knew as children. 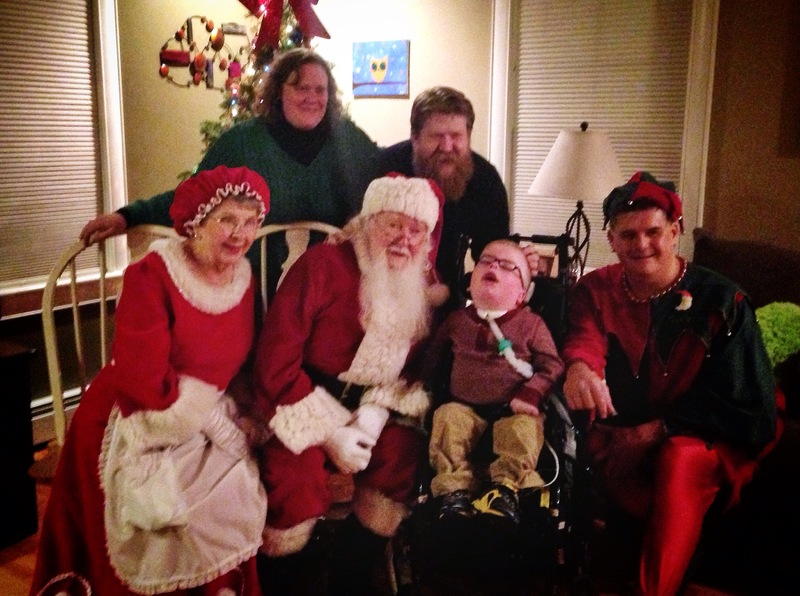 The expression of love and friendship rings deeply in our hearts for you,Karen and Liam, and of course for Santa,Mrs.Claus and Tiny for bringing that joy back to us. It is a time to thank God for all our blessings… and now we have 3 more.. This is Evie’s sister. She perfectly captured how we all feel. We all felt blessed to be part of such a special and magical night. A family can never have too many members (especially ones as cute as Liam), so welcome! This is so great. Have a Merry Christmas and Liam, Karen and You are in our prayers. God Bless you all. YAY Liam!!! I have tears streaming down my face right now! Thanks for Sharing!!! I’m sorry I’m so late to read this, but what a wonderful story in the midst of some crazy times in the world. You wrote so beautifully. This needs to be published!